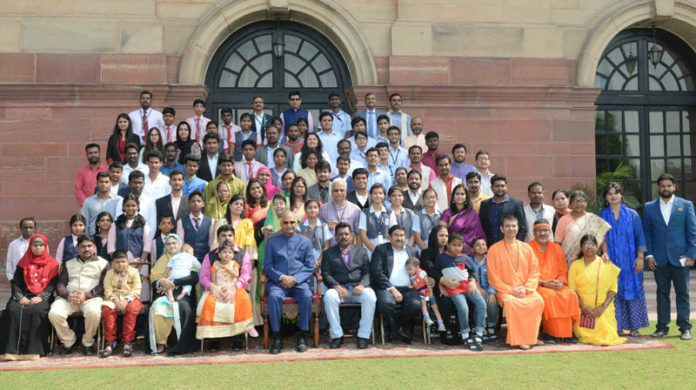 The President, Shri Ram Nath Kovind with the children of Dr. Kalam Sandesh Vahini Vision-2020 those who travelling by bus from Rameswaram to Rashtrapati Bhavan, in New Delhi on October 15, 2017. New Delhi: Children who arrived at Rashtrapati Bhavan from Rameswaram by the bus ‘Dr Kalam Sandesh Vahini Vision 2020’ called on the President of India, Shri Ram Nath Kovind, at Rashtrapati Bhavan today (October 15, 2017).